SONIC Brings Extra Crunch and Flavor to Drive-Ins with New FRITOS Chili Cheese Faves | Sonic Corp.
OKLAHOMA CITY--(BUSINESS WIRE)--Nov. 26, 2018-- SONIC® Drive-In (NASDAQ: SONC) takes the quirky, comforting flavors of a beloved snack and makes it available for any occasion, any time, by adding new FRITOS® Chili Cheese options to a variety of menu items. With at least three ways to add a warm, salty and savory crunch to any meal, the new SONIC FRITOS Chili Cheese Faves start at just $0.99*. The FRITOS Chili Pie is made with crunchy FRITOS, savory chili, topped with melty cheddar cheese. The FRITOS Chili Cheese Jr. Wrap includes the same delicious ingredients bundled up in an 8-inch flour tortilla to create a perfect bite every time. The FRITOS Chili Cheese Jr. Burger is made with FRITOS, chili and melty cheddar cheese atop a juicy 100-percent beef patty, all sandwiched between a soft bakery bun, making for one sensational burger tasting experience. 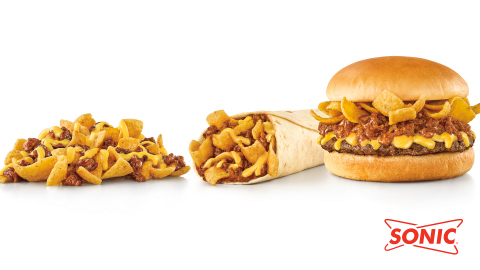 Amp up a SONIC classic, by creating one more option by adding FRITOS to the Chili Cheese Coney**. Starting at just $0.99, guests can order the SONIC FRITOS Chili Pie and FRITOS Chili Cheese Jr. Wrap along with the SONIC FRITOS Chili Cheese Jr. Burger, starting at $1.99, while supplies last*. With the Sonic app, guests are First in Line Every Time and SONIC drinks and Slushes are half-price any time guests Order Ahead***. The SONIC app is free to download, and available in the Apple App Store and Google Play Store. * Tax not included. See menu for details. For a limited time only at participating SONIC® Drive-Ins.